I was out skiing on Vallåsen in Sweden on the 20th of December when I suffered a knee injury. I took a wrong landing on a kicker while skiing. It was not on the mono, but on regular skis. I ended up on the back skis while trying to stick the landing and while trying to recover, my ski slid out twisting my left knee. I could feel instantly that something was wrong and after a few minutes of lying down I tried to stand, but the pain was intense and the knee would not support my weight. It hurt like hell and I had to be transported down on a snow scooter for medical care. At the hospital they did x-rays and could luckily confirm that nothing was broken. I do have some damage to the ligaments, but the extend is still unknown and will have to wait for an MR-scan. I’m optimistic since here 5 days after the incident my knee is able to support me. With a bit of luck the injury will heel by itself in a couple of weeks. For now I wish you all a Merry Christmas and a happy new year. I’ll be spending mine on the sofa! Advanced Medicare with Bowmore Single Malt Scotch Whisky! This winter season I’m bringing back the mono-ski. I have been on two planks for more that 30 years. Now it’s time to to try something different: A Mono-ski! My setup is an Alpine Rocket 178 from Snowgunz in Chamonix! I’m Bringing Back The Mono in Scandinavia! Video to come soon, where I will ski the sickest lines on Mono! I will also be racing in April at the Derby de la Meije, at La Grave, France. It’s a 2000 vertical-meter ungroomed downhill race through death chunks, crevasses, frozen debris and rock hard moguls. There are only two gates, one at the start, one at the finish and I’ll do it on the Mono! It will be my first ski racing since I as a kid in the late 80s had a brief spell with the Danish National Youth Team. 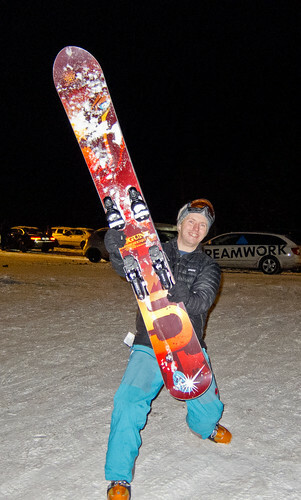 In my quest for monoski world dominance, I had that first slope session tonight. It went quite well! The mono is really a magnet of female attention. I wonder if I can handle the fame.